An innovative conservation project that was incepted in response to an alien insect’s invasion of Guam has reached a crucial milestone in 2015. 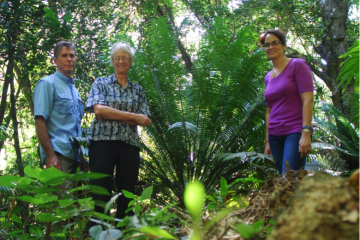 “This highly successful conservation project was initiated in 2005 by the Department of Defence on Guam as a means of conserving the endangered native tree, Cycas micronesica,” said Thomas Marler, Principal Investigator of the project. The early work was designed to collect seeds from all of Guam’s varied habitats before the trees started dying in response to the 2003 invasion of an armored scale what was known to be a tree killer in other geographic regions. “The insect’s name is Aulacaspis yasumatsui, and the tiny insect builds up such heavy infestations on each tree that mortality occurs in less than one year for most trees,” said Marler. “The idea behind this sort of conservation approach is to grow specimens of the endangered species in a location away from its native habitat as a means of providing a safe haven for the trees,” said Anne Brooke, Conservation Program Manager for Naval Facilities Engineering Command, Marianas. Brooke has represented the Department of Defence throughout the project. In this case, the rescued plants have been established in remote limestone forests on the island of Tinian, where the devastating insect pest does not occur. This approach is ideal for a situation like that on Guam, where the threat to the endangered species is a biological threat that is difficult to mitigate. Removing the representative genes of the endangered species from the Guam population and getting them established in a safe zone is a sort of insurance. “If we continue to fund and manage this off-site collection, we are insuring that the biological resource is conserved and is available to repatriate Guam in the future,” said Brooke. The Tinian nursery was established in 2006, and the plants were transplanted to the remote conservation site in 2008. “Numerous outcomes of this project since those early years have improved our ability to make conservation decisions in the Mariana Islands, and we look forward to the project providing many more improvements in how the Department of Defence approaches its conservation obligations,” said Brooke. p class=”p1″>“The 2015 milestone may just do that,” added Marler. The management team documented initial reproductive events on male trees in June 2014. This is a common phenomenon where male trees transition from the juvenile to adult life stage at a younger age and smaller size than female trees. The documentation of the first female trees to reach reproductive age in March 2015 provides the team with a milestone that enables the study of pollination biology in a manner that is not possible on Guam. “Our Guam pollination biology research has shown that Guam’s native insect pollinators and wind work in tandem to help this tree make seeds,” said Marler. “The Tinian project is now positioned to provide a unique opportunity to study pollination biology where no native insect pollinators exist, allowing us to unambiguously study the role of wind pollination,” concluded Marler.